I am 54 years old, 5'4" and about 145lbs. Looking at a pair of the new Kastle MX88's for mostly east coast riding. They have a 158 and a 168 size that I am not sure what would be best for me. 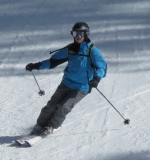 I normally ski a 160 frontside ski which comes to the top of my head (without boots on). Therefore, the 158 would be at the top of my forehead and probably middle with boots on while the 168's will be about 3.5 inches above my head. There is s lot of confusion as to correct sizing for these wide skiis - some say go larger, others say go shorter. I understand that the longer = more float and better for open terrain, while the shorter is better for trees and tight turns. The major problem for me is whether the longer ski will be harder for me to handle. Appreciate any help. Thanks. IMHO- go to the shorter size. There is nothing inbetween? Separate from whether that is the right ski for the east coast, go shorter of the two. There is nothing in-between - they go from 158 - 168. The 168 will be about 4 inches above my head, but I heard that these are soft and will get better flotation in powder. Since I have 2 pair of frontside carvers at 160, thought the 168 may be good for my quiver - just concerend over handling skis this large as i never skied on anything larger than a 160!! my .02 is that 4" above your head is too long. The problems seems to be asynchronous , sometimes is not working . Is there any log to see if this sql server deny a request from my forum ?